Priests in the Diocese of Rockhampton have already begun celebrating Christmas Masses, providing hope for communities devastated by prolonged drought and catastrophic bushfires. Source: ACBC Media Blog. Fr Matthias Ogwo, Fr Raj Kodavatikanti HGN and Fr Ronaldo Rodriguez will collectively clock up several thousand kilometres driving between isolated mining towns and farming communities this Christmas season. 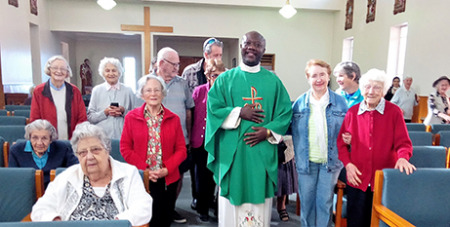 In the central west of the diocese, parishioners are still praying for more rain after a blessing of 30mm last week, according to Longreach relief priest Fr Ogwo. He said his location involved much driving among the cluster parish churches, sometimes up to 200km between towns.